The big and highly optimised v1.5.1 update of the Windows version is out now as well. 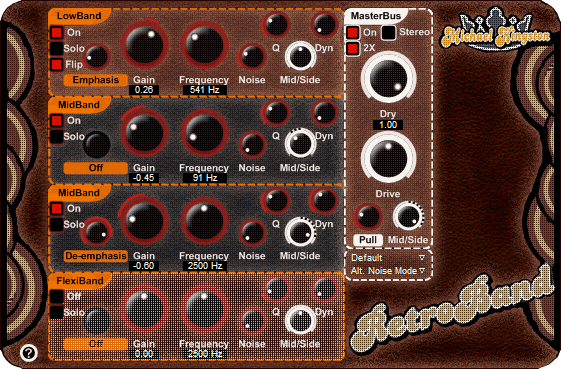 I have just released two new kinds of windows VST distortion plugins: RetroBand and RetroBandLite. The other is free, the other very cheap, and they both sound great (but don't take it from me, have a listen and try yourself). RetroBand models several aspects of the interaction between gain stages and transformers of analogue gear, referred to as intra-modulation (IM), ie. Class A/B gain stage switching distortion. It also features several forms of transient shaping in-between the stages. RetroBand is a distortion unit at heart, but this type and concept hasn't been previously available as a digital model. It may desirably enrich sterile sound sources. Failing equipment can be easily simulated and this allows plenty of creativity. With some luck, it makes things sound larger than life. The transient enhanced IM with mid-side stereo control can change or revive a stereo image, too. Head to the website for all the info you might need. Re: RetroBand VST plugins. A good kind of distortion model? hell of a good job, i just tried the Lite version. But, I was really impressed, i like the DE-emphasis and Emphasis switch, comes in really useful. Used it on a stereo mix with harsh cymbals/ top end and tuned the freq to 5k, de-emphasis and master on Push. Softened that harsh sound really well, it can be really subtle too which is needed for mastering obviously. I almost finished the master till i realized the lite version only did left - right or center channel! ...OOOPS! Great work, and I may look to purchase the full version very soon! Any chance of ever porting this to Mac? RTAS? Excellent! Good to find out about people who understood these plugins. I've always feared the difficult concept will scare people off. Of course the RetroBand full version will do stereo as well (and oversampling, meaning it sounds better), and since you're already doing mastering type things, you will appreciate the extensive mid-side features. But first check out the Trial version to see if it works for you. some important announcements coming from the RetroBand coding vaults where the programmers have been locked for two weeks with no food until they come up with a release worthy of the customer requests this far. 1. complete change of development platform resulting in numerous speeds boosts and improvements. 2. Everything is cross-platform compatible, which means there will be several flavours of OSX versions. 3. RetroBand is now internally fully 64bit, which means the sound has been improved substantially (less aliasing and processing artifacts). There are some algorithmic tweaks as well, resulting in clear leap of sound quality. 4. as a bonus, RetroBand is now roughly twice as fast. When it previously used 4.2% of CPU in normal mode, it now uses only 2.2%! YAY! This thing is just about to move to beta stage, so stable release is looming several weeks ahead from now. Existing customers will receive update download details as soon as it's done, and I'll update this thread accordingly. this is the release week so I thought I'd pop in to make an unofficial announcement. 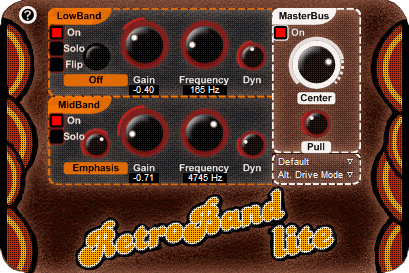 RetroBand and RetroBandLite will be released for OSX VST this week. All the stuff on the list above still apply, and the windows update will be made available simultaneously. Existing customers will receive upgrade mail by the end of the week, and the rest of you stay tuned here. I suspect the next question from the OSX front would be about the AU version. It will happen sometime in near future, but the VST version has been verified to work perfectly with the reliable fxpansion VST-to-AU and VST-to-RTAS adapter, with just about no CPU hit (just like with any plugin really). Last sunday a major update to RetroBand was released and it was finally made available as OSX VST. Things did not quite go as planned as too many users soon noticed, and there were major problems. Fortunately all of those were easy to track thanks to crash reports and such. All the reported problems, bugs, crashes and glitches are now fixed. Apologies for having ever released such an ill-fated update. 1. Fixed dependency on zlib1.dll and the file is no longer needed. 2. Fixed complete muting of sound or crashing in certain hosts when switching presets or opening the editor window. 3. Adjusted individual band 'Emp' parameter range and knob behaviour. 4. Removed sound bursts when switching presets. 5. Shortcut to HTML manual now works if user keeps installed directory structure intact. 6. Mouse no longer "clamps" when tweaking knobs. 1. Mac OSX Tiger Universal Binary versions now available. 2. Windows version is no longer tied to SSE enabled CPUs and will work on even older models. 3. CPU and RAM usage excessively optimised, in some cases more than halved. 4. All processing is now internally 64-bit -> improved sound quality. 5. New 'residual' noise mode. (does not apply to Lite version). 7. Main output volume attenuator. 8. Safety 100Hz Hi-pass filter. 9. Various tweaks and optimisations of the DSP engine. 11. Plugin initialisation is significantly faster. 12. Installer for better deployment, detects CPU and enables right optimisations for it. I've released a handy little update for the RetroBand plugins and reduced the price of the full version permanently (EUR39 now). Especially Windows users have a reason to rejoice as CPU usage has been reduced significantly. Miscellaneous OSX bugs were fixed as well. 1. Major DSP optimisations. RetroBand now uses roughly 2/3 of the CPU compared to previous versions on Windows. 2. File size of the plugin was halved on Windows. 3. Major memory usage optimisations with the GUI on OSX and Windows. 4. Fixed incompatibility with VST-to-AU adapter with recent OSX Tiger versions. 5. Fixed and optimised mouse and redraw functions for more recent OSX Tiger versions. Registered users will receive their update and download details by mail by tomorrow. The rest of you head on down to http://www.michaelkingston.fi/retroband/ and download the free RetroBandLite or RetroBandTrial versions.